At a short distance from the boundaries of Ayodya, there was a forest in which was situated sage Vishwamitra’s hermitage. There the sage used to perform Yajnas in the company of other ascetics and hermits. But the Rakshasas (the demons) had grown very powerful. Two of them, Marich and Subahu, used to disturb the sages be desecrating the alters. When the ascetics and sages could no more tolerate the undesirable intrusion by the Rakshasas, they requested Vishwamitra to do something. 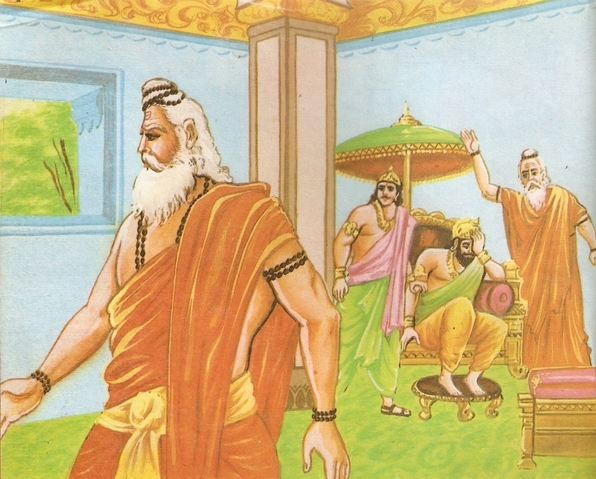 Acting upon the advice of the family priest, King Dashrath at once went out of the palace to receive sage Vishwamitra. He touched the sage’s feet and said, “Your pious presence has made Ayodhya a holy place. 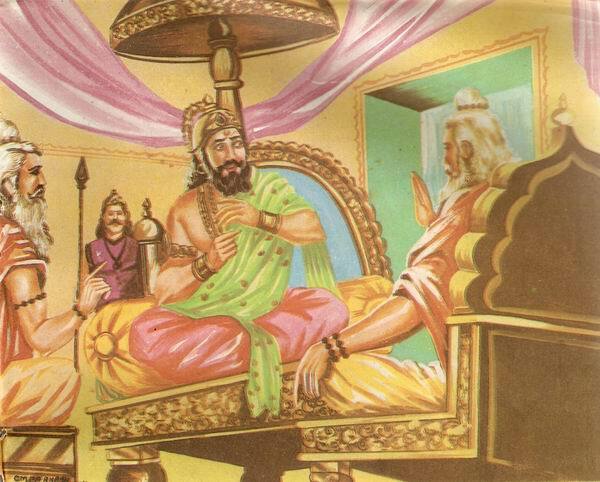 “ The king led him to the court and offered him a seat near sage Vasishtha. “Stop worrying, Your Holiness! 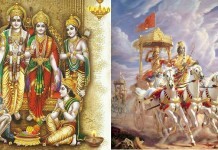 I shall send my soldiers who will kill any Rakshasas who comes near your Yajna altar. And, if required, I myself shall go there. 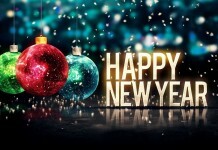 You may rest assured,” said King Dashrath. “No, your solders will be of no help. Send Rama and Lakshmana with me. Then every thing will be set right,” said Vishwamitra. “You are free to refuse if you so desire,” saying this with anger, Vishwamitra got up to leave. “Why don’t you ask Dashrath not to argue but to do as I say?” said sage Vishwamitra. There is no reason to be worried of. Both of your sons will return richer with experience,” thus assuring King Dashrath, sage Vishwamitra led Rama and Lakshmana out of the palace. While passing through the forest on their way to Vishwamitra’s hermitage, they were confronted by Taraka, a wicked she-demon. When she saw two young princes accompanying the sage, she was tempted to eat them. She dashed towards them. “Rama, Beware! She is Taraka. 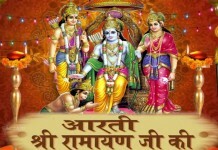 The main creator of trouble in the forest,” sage Vishwamitra warned Rama. 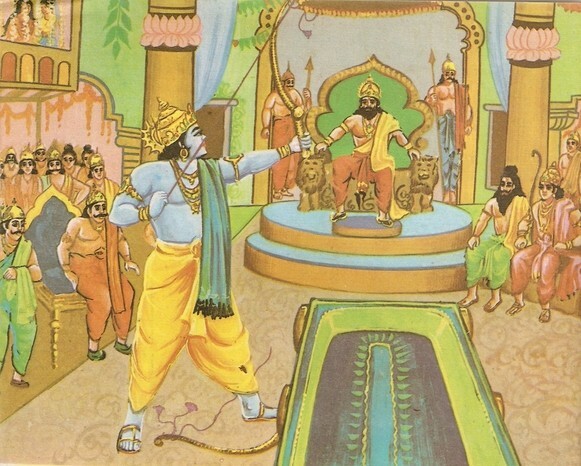 Rama immediately killed Taraka with an arrow shot from his bow. In the hermitage, the sage trained the two brothers in the use of divine weapons. After that training, they were fully prepared to fight the demons. “May God bless you with long life,” said the sage and he got busy with the rituals, along with his fellow ascetics and hermits. The news of Taraka’s killing made both Marich and Subahu mad with rage. They reached the Yajna site to desecrate it. A usual they began throwing flesh and bones of dead animals in the sacred fire. 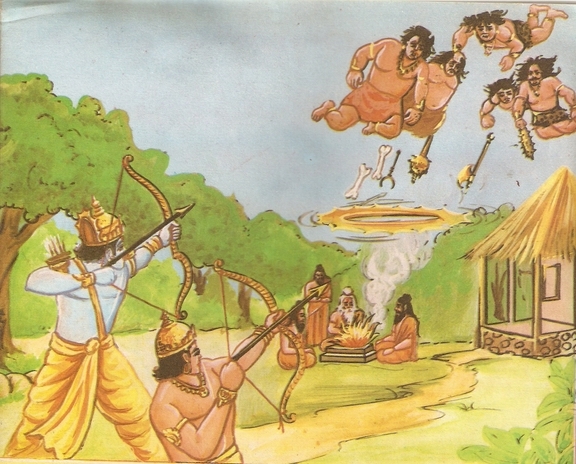 Rama at once shot an arrow which rotated above the sacred altar with such a speed that it formed an umbrella and the Rakshasas failed in their attempt to disturb the holy rituals of the Yajna. 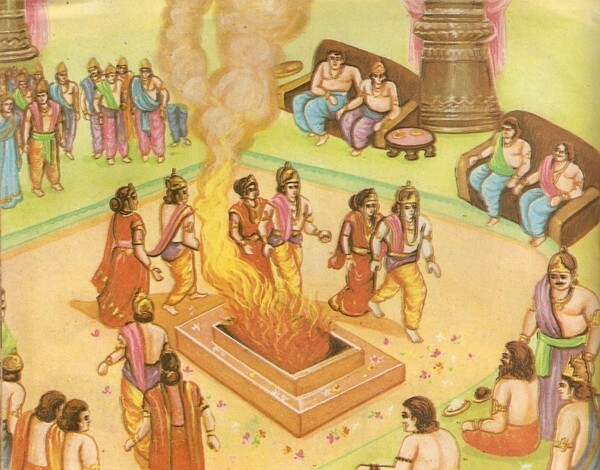 On the sixth day of Yajna, Marich and Subahu again came there with a large number of their followers. 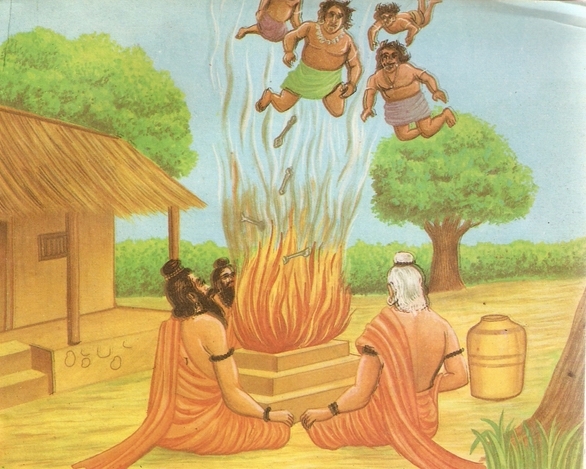 They were determined to desecrate the holy site of Yajna. 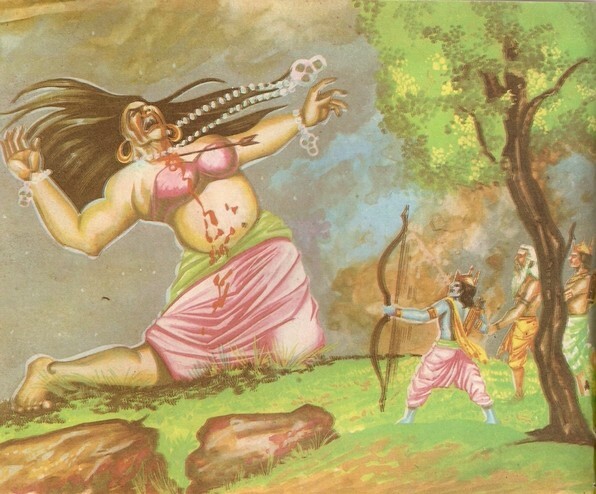 “Permit me to kill them all,” said Lakshmana with his bow ready to shoot. 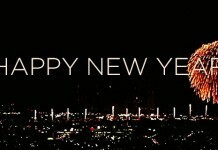 “Well! You will engage Subahu and let Marich be my victim,” saying so, Rama drew his bow and instantly Marich was hit by the arrow which took and threw him and instantly Marich was hit by the arrow which took and threw him in the ocean a hundred miles away. 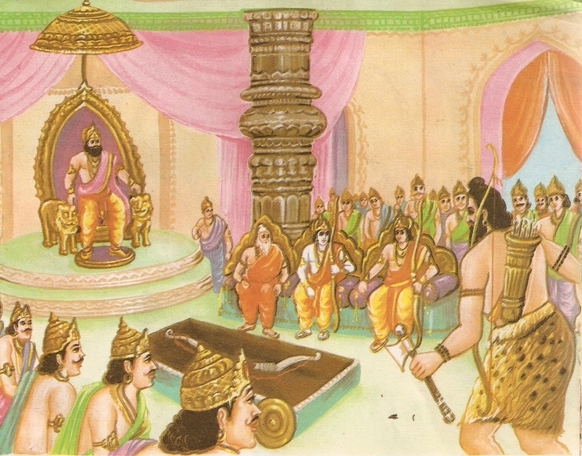 Subahu was killed by Lakshmana. “We shall be honoured to obey your order.” Said Rama and Lakshmana with humility. On their way to Mithila, they saw a vacant hut, with a huge stone lying outside it, in the forest. Fama asked sage Vishwamitra what that was and why the hut was unoccupied. “This is sage Gautam’s wife Ahilya who was cursed and turned into stone by the sage,” said Vasishtha. As soon as Rama touched the stone, it regained the form of young beautiful Ahilya. Washing Rama’s feet with her tears, she said, “I was a sinner. You have granted me salvation. No doubt, you are God incarnate.” Having said so, she left for the heaven. 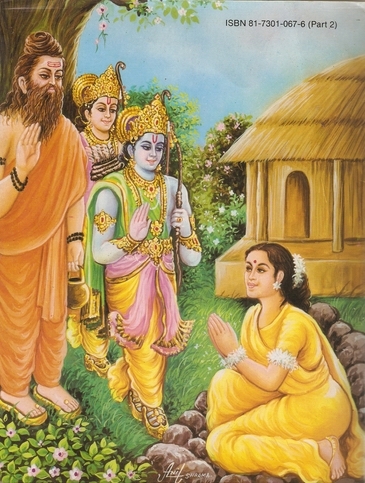 In Mithila, sage Vishwamitra stayed in a beautiful garden, with Rama and Lakshmana. King Janak came there to pay his respects. 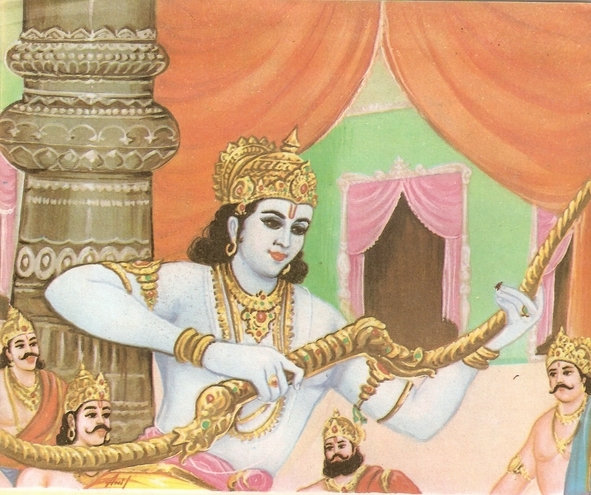 The sage blessed him and told him who Rama and Lakshmana were. King Janak himself escorted sage Vishwamitra and Dashrath’s sons to the hall where Swyamwar was to take place. On a dais the grand now of lord Shiva was placed. Only he could ask for Sita’s hand who would tie the string of the bow first of all. Sita was also brought in the hall by her friends and maids. Every one, present there, was captivated by her beauty. When every thing was ready, King Janak asked the royal bard to announce the condition of the Swyamwar. Many kings and princes tried their best but failed in their attempt to fulfil the condition. Those, who boasted of their physical prowess, had to face humiliation. The foolish ones made laughing stock of themselves. Those, who were mature and wise, did not try. King Janak began to lose heart at what was happening. He feared his vow would prove an injustice to his daughter. He felt himself a culprit. 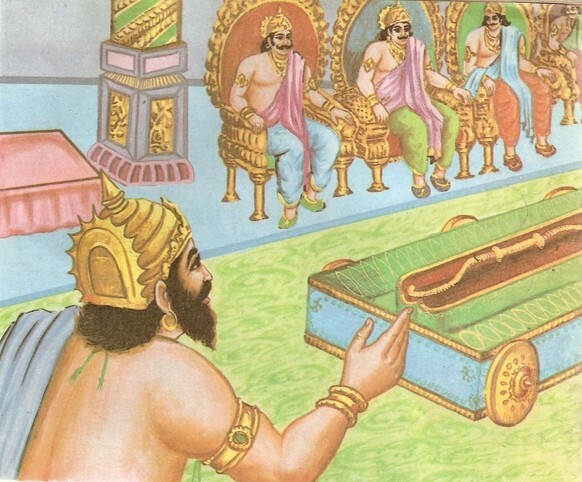 Rama, after bowing before the sage, walked up to the dais and attempted to pick up the bow. “No, Sister! Don’t underestimate the sages and ascetics. Don’t you know that sage Agastya dried up the ocean. Gods like Brahma, Vishnu and Mahesh are helpless before a small incantation,” said Sita’s aunt assuring the queen. 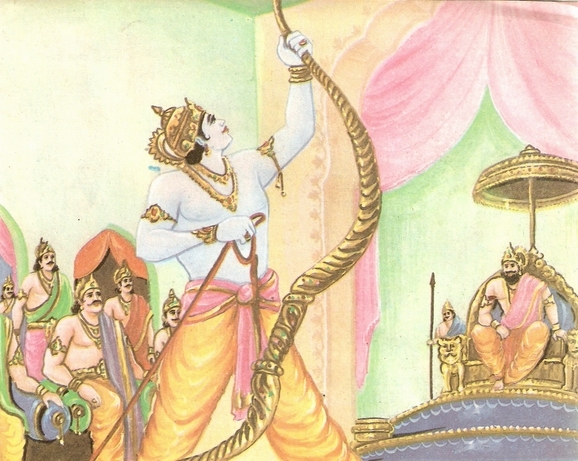 When Rama tried to bend the bow to let the string reach the other end, it broke into two with a big bang. The sound of the bang was deafening. The hall resounded with its echo. Everybody was forced to put fingers into the ears. All were stunned, but King Janak was very happy. 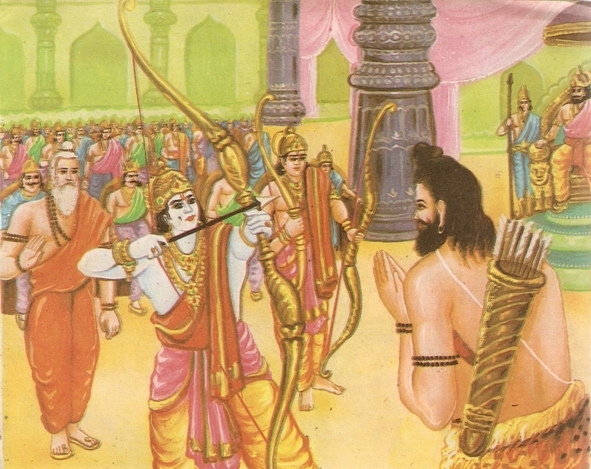 Rama threw the two pieces of the bow on the ground. Atmosphere of melancholy vanished at once. Musicians began to play upon their instruments and dancing girls started dancing without being ordered, just out of joy. The exploding sound, created by the breaking of lord Shiva’s bow attracted the attention of the great sage Parshuram of the Bhrigu dynasty. He at once reached the Swyamwar-site and challenged him who had invited his death by breaking the bow. “You fool! Don’t you know you are standing in front of death? That is not an ordinary bow, it is Lord Shiva’s bow which no human being can move a bit,” was Parshuram’s reply. “We don’t find any difference between this bow and any other one. It was an old useless bow and broke into two at the touch of brother Rama. How can you blame him?” said Lakshmana. “I am known as the destroyer of Kshatriyas. Shut your mouth and save your life,” retorted Parshuram. “O Great Brahman! We have tolerated you because we do not hit a god, a Brahman, a saint and a cow. So, provoke me not,” said Lakshmana. Parshuram lost self- control at what Lakshmana had said. He shouted, “Vishwamitra! This boy is not only foolish but also arrogant. I was still now lenient because of your young age,” saying so, he raised his axe to attack Lakshmana. 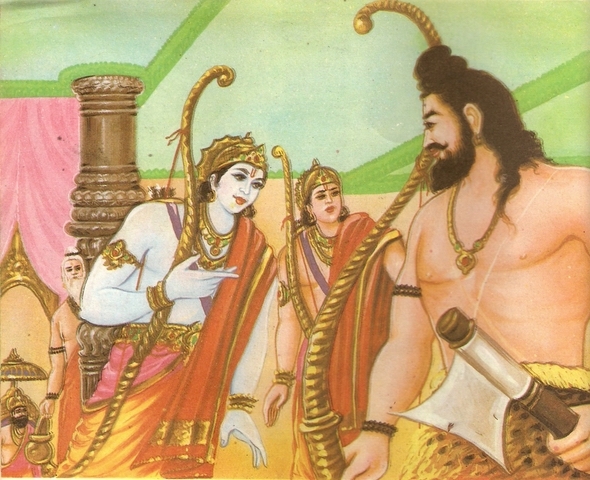 Then Parshuram gave his own bow to Rama to draw its string. 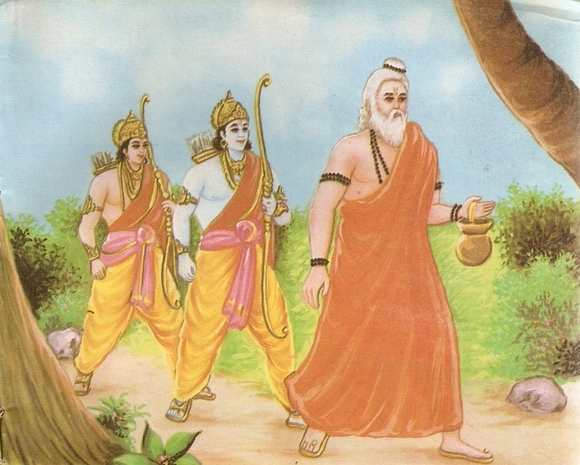 When Rama did so, Parshuram by then knew that Rama was not an ordinary man. 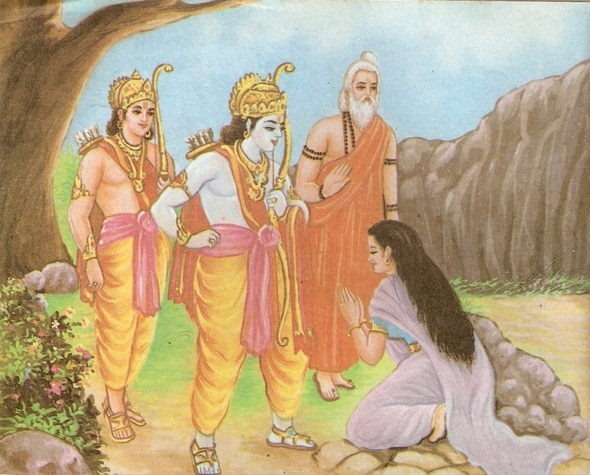 He bowed before Rama out of respect. 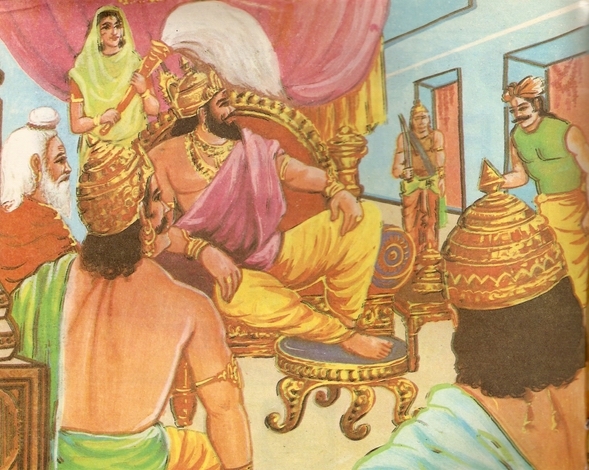 When King Janak found that Parshuram had been pacified, he gestured to Sita’s friends to lead her to Rama. 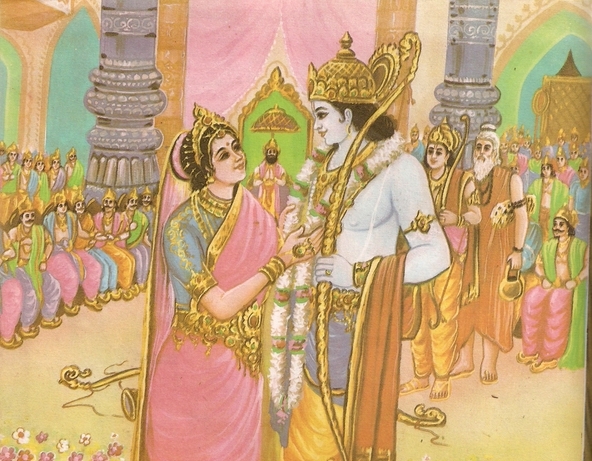 Standing before him, she glanced at Rama and put the flower garland around his neck. 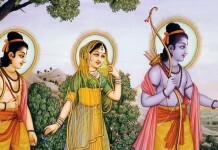 That indicated her choice of Rama as her husband. “O King! Send some messenger to Ayodhya to inform King Dashrath so that he comes here for the solemnisation of the marriage,” replied Vishwamitra. 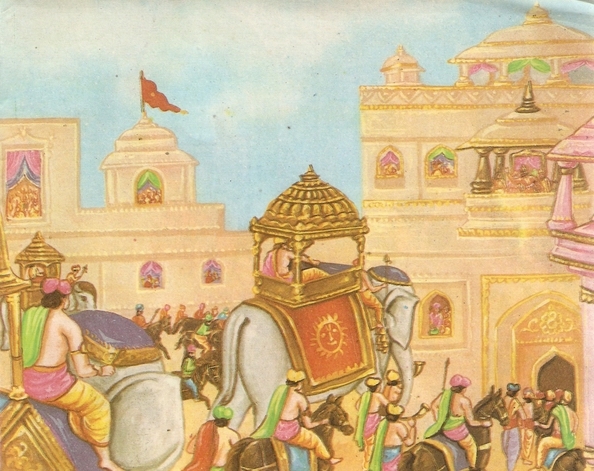 Janak at once despatched his man to Ayodhya. 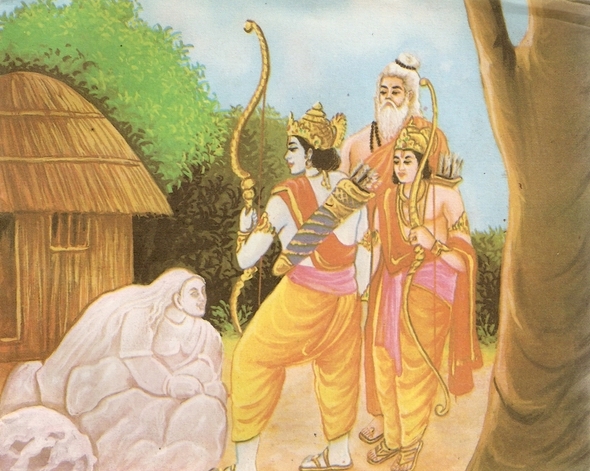 Janak’s messenger, after reaching Ayodhya, did not take much time in meeting the telling Dashrath of Sita’s choice of Rama as her husband. King Dashrath was very happy and excited. He sent the happy news to his queens without losing any time. 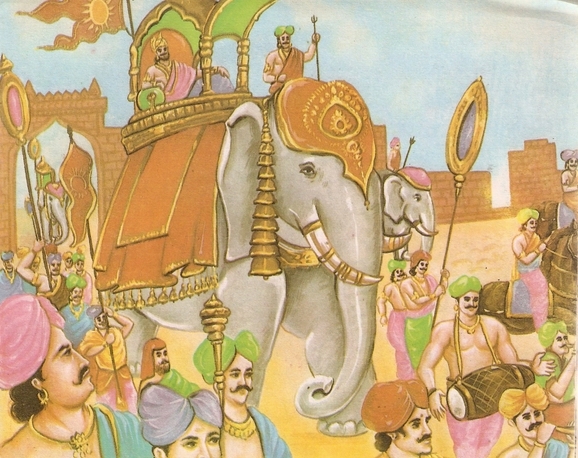 Bharat and Shatrughna cane running to their father as soon as they heard of the message of King Janak. Dashrath asked Bharat to make arrangements for taking marriage party to Mithila. “As you order,” saying this Bharat and Shatrughna got busy with the job. Chariots, elephants and horses began to be decorated. King Dashrath with the family priest sage Vasishtha, relatives, courtiers and other elites of the city reached Mithila the very next day. The people of Mithila were over-awned with the grandeur of the marriage party. Marriage party was also pleased at the grand reception given to them. 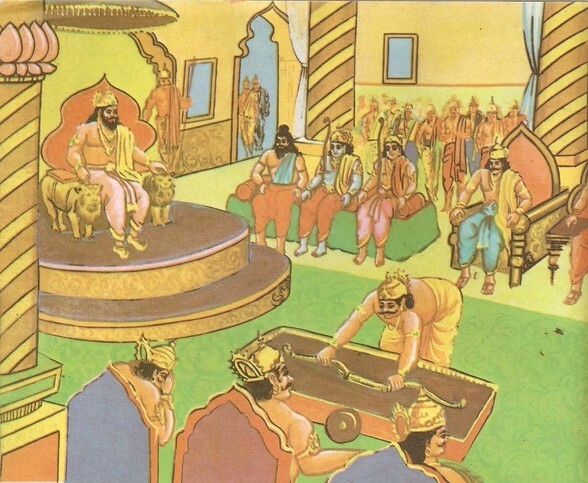 King Janak and his relatives welcomed King Dashrath and other members of the party with great respect and enthusiasm. They escorted the guests to the place where marriage ceremony was to be performed. 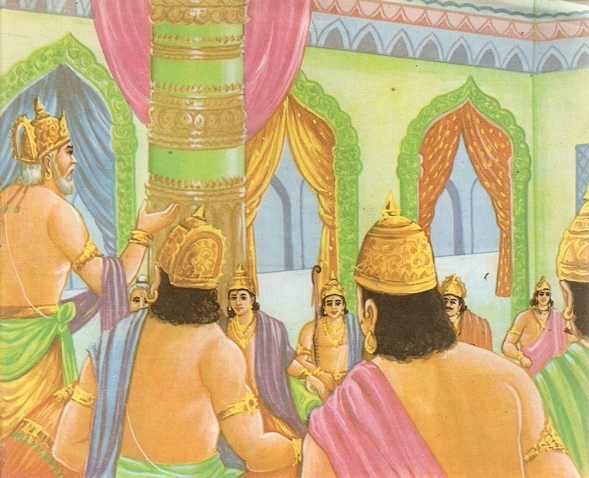 Reaching there, King Janak requested his family priest Shatananda to perform the ceremony. He further said, “You may please solemnise the marriages of the four brothers at he same altar.” This Lakshmana was married with Urmila, Janak’s second daughter and Bharat and Shatrughna with Mandavi and Shrutikirti, the daughters of Janak’s younger brother Kushadhwaj. After the ceremony, Janak gave cart-loads of ornaments, jewels, clothes and other valuables as dowry to his and his brother’s daughters. 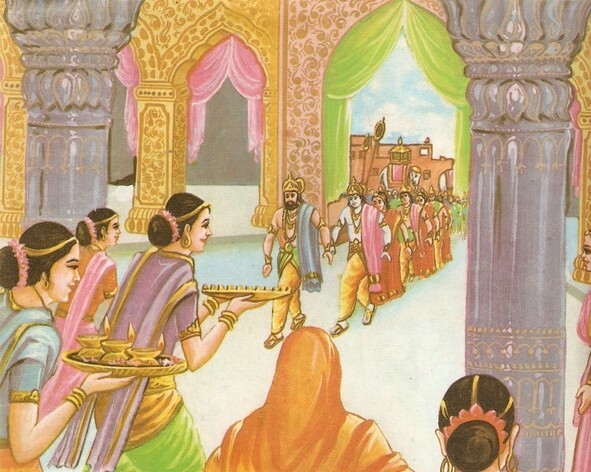 Then the marriage party left Mithila with the brides and reached the outskirts of Ayodhya. The entire city had turned out to welcome the king, the princes and the brides. 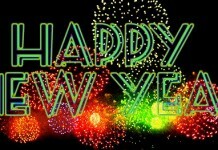 Every house and shop, every land and square was decorated with flowers and buntings. Every body was in a festive mood. Before entering the city, Dashrath worshipped god Shiva, Parvati and Ganesh, as advised by the family priest sage Vasishtha. Kaushalya, Kaikeyi and Sumitra were standing at the main gate of the palace, with golden trays full of flowers, incense and sweets. They were there to receive their sons and their brides. After greeting them, Kaikeyi donated a large quantity of golden ornaments and clothes to Brahmans and others as a votive offering. Then the brides were led into the palace in the company of singing women.